My friends called me “Tree” in school. My last name was Wood, and I was tall, and so “Tree” I became. Little did they know that a giant, magnificent Magnolia at the end of our street was my favorite spot. The perch where I retreated, the jungle gym where I stretched and climbed, the spot where I sat and watched bluejays and squirrels, my earliest form of prayer. My branchy pew. 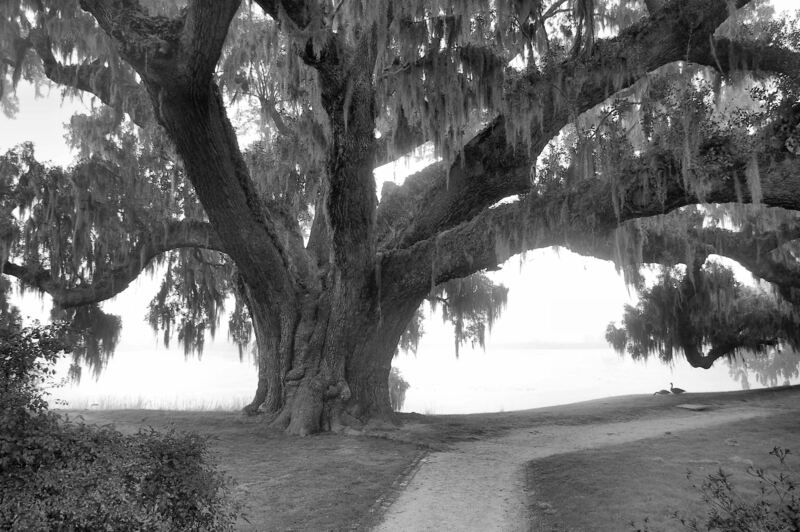 Noel took this picture of Middleton Oak, a 3000-year old Live Oak on the banks of the Ashley River. 3000 years – a medieval cathedral. A monument to root and trunk, leaf and bark, the alchemy of acorn, time and wonder. She is a mystic draped in Spanish moss prayer shawl. A monk whose liturgy is limb and languor. Shortly after this image was made, the ancient oak got sick, and now she presides over the river bank with diminished reach. Almost half of her right side has been amputated. We pilgrimage to her often, and I sit under her wingspan, humbled and peaceful. She whispers “rest,” and I obey. She demands “relinquish” and I say, “I’ll try.” I bow to her beauty, her brokenness, her immense rootedness, and say “amen.” This Tree is home. ~ by Stephanie on 01/16/2010. The best thing about where I live is that there are giant oak trees on the property. I swear- they are huge. And they are like the sea, in a way to me. Complete solace because they are so ancient and so big and I look up into their branches and I see how they are so old but have leaves so new and that life pulses, still, through those house-sized trunks and I am grateful beyond measure that I can, for this time in my life, share space with them.